Welcome to Rohan Glass Company, a three generational locally and family owned and operated company in North Hollywood that is ready to help you with all of your glass and mirror needs. Since 1964, we have provided full service custom glass sales, installation, repair and replacement for virtually every type of glass you need for your home or business in the San Fernando Valley. 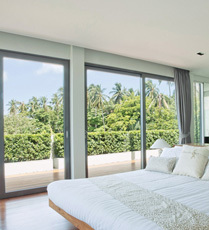 From frameless shower doors, windows to doors, glass to mirrors, we’ve got you covered. We install only the highest quality glass, so you can know for certain that all of our products will be reliable and long lasting, saving you money that you would otherwise spend on future repairs. Rohan Glass Company is state licensed C17. Contractor license# 258852. We are also bonded and insured. At Rohan Glass Company, we are professional and prompt in everything we do from start to finish. We constantly strive to meet your needs, whatever those may be. 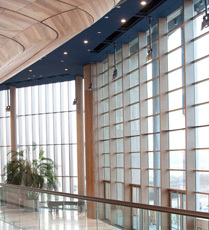 While integrity is important, experience is also essential in providing the best possible customer service and quality craftsmanship on all your glass installation and repair needs. 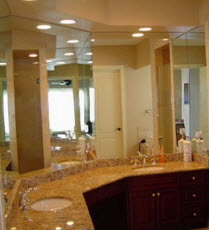 We require our professionals to undergo specialized training to replace doors and windows of all shapes and sizes, and we are here to help you custom design most any glass solution – whether it’s glass shelving, table and countertops, vanity mirrors, shower enclosures, storefronts, you name it! Our goal is to meet and surpass your expectations. We will do everything we can so that you have a pleasant, stress free experience with us.